SatHunter is a program for calculating the orientation of a satellite antenna. SatHunter contains all the necessary information for adjusting the satellite antenna to the selected satellite. The adjustment is made with the help of available tools (a compass or a protractor, a plumb, a tape measure) and requires neither expensive equipment nor deep knowledge about satellite television. 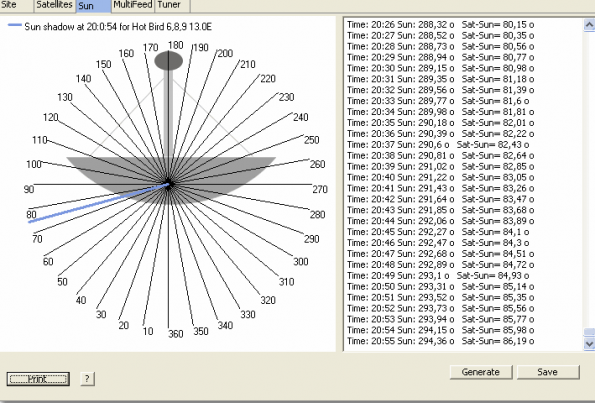 SatHunter – An easy-to-use tool that will help you to align a satellite system and easily find the signal from a satellite. The program has many features, such as: Sat azimuth, Sat elevation, Transponder list, DVB Tuner and more. SatHunter – Find TV satellites in the sky. Calculates the azimuth and elevation angle. Provides a list of satellite transponders for setting up the receiver. 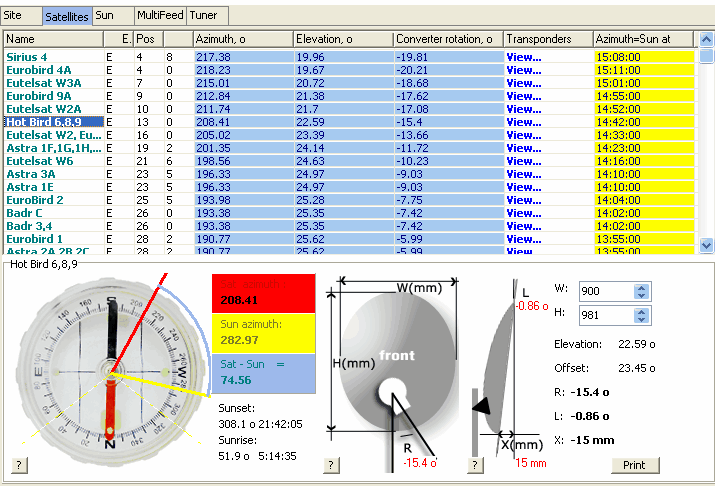 Calculates the solar azimuth angle. Calculates the time when the satellite and solar azimuth angles coincide. Calculates the antenna offset angle and tilt. Points the antenna using the azimuth with the help of the sun and a protractor. Points the antenna using the azimuth with the help of a compass. Adjusts the elevation angle with the help of a tape measure and a plumb. Detects coordinates by IP or by using a list of cities. Detects time using an exact time server. Scans transponders with a SkyStar DVB card. View signal level and quality with sound signalization. Time and date are automatically adjusted when you start SatHunter. At any moment you can get the local computer time (using the Get local time button) or get it from an exact time server (using the Get SNTP Time button). Enter your local geographic coordinates. If you do not know your coordinates, select the nearest city from the city list or click the “Autodetect” button, and SatHunter will try to detect your location automatically. Find the difference between the solar azimuth and the satellite azimuth for the desired time. The shadow from the sun will point to this angle in case of exact orientation towards the satellite. 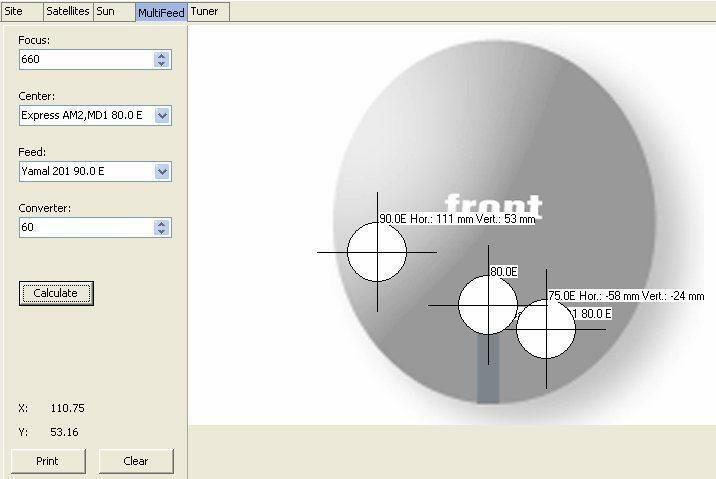 Print the protractor and attach it to the antenna (180 forward). Match the shadow with the selected angle by rotating the antenna. It is possible to receive a signal from several satellites with one antenna. To do so, position the LNBs according to the calculated scheme. Focus – Focal length (in millimeters). This is the length between the LNB and the point on the satellite dish to which it is directed. Converter – LNB diameter (in millimeters). Enter the parameters, then click “Calculate”, and SatHunter will calculate the LNB position. Mount the second LNB and connect it to the receiver via the DiSEqC switch. 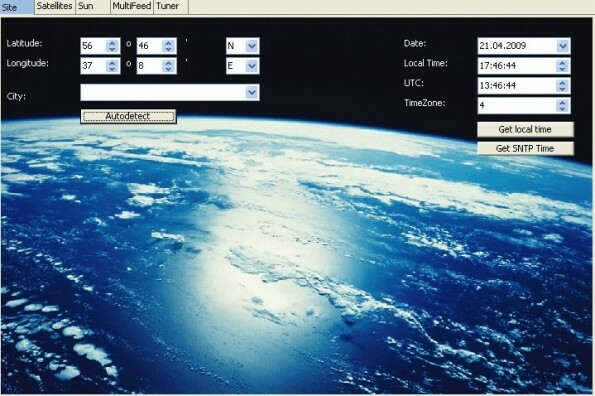 If there is a SkyStar tuner installed on your computer, you can use this section to fine-tune the antenna. Use the list to select the necessary transponder or enter its properties manually, then click the “Set Tuner” button.